One of the Bawden’s Holstein cows, and her camouflaged calf, on pasture where they belong! New York’s St. Lawrence County — the state’s largest — is also its northernmost, bordered by the St. Lawrence River and, across the river, Canada. The part of the river bordering the small towns in the northwest corner of the county is known as the ‘Thousand Islands,’ named after some 1800 islands in just a few miles of river. It developed as a playground for the rich and super-rich during the ‘Gilded Age’ between the Civil War and World War I, with wealthy families buying whole islands and building vacation homes on them. George M. Pullman of sleeping car fame, as well as the heads of Scribner’s Magazine, Macy’s Department Store, the American Tobacco Company, and the Singer Sewing Machine Company were some of the executives creating such island ‘castles’. For the merely rich, sumptuous hotels were erected on islands and shore alike, reached by rail and then river steamboats. It was quite common for families of the rich to spend all summer there to escape the heat of New York City. Today the renown of the Thousand Islands has largely disappeared. For the enjoyment of the remaining summer tourists, some old town halls along the river, once luxurious with second floor theaters devoted to opera production, have been renovated and the upstairs turned into auditoriums for contemporary music and theater with the downstairs now made into gift shops selling local art and crafts. Out on the river one can still buy passage on a tour boat to learn the history of the castles and mansions one is drifting by, built during the region’s heyday. Agriculture, of course, has long been the occupation of the not-so-rich of the area. The farmland soil along the river is as flat as alluvial soil deposited anywhere, but is not ideal for agriculture composed as it is largely of glacial till with marine silt and clay sediments. Yet it is good enough to have supported numerous dairies over the years. Before the advent of fluid milk as the diary product of choice, butter and cheese sales paid the farm mortgage. In the 1880s there were 92 creameries in the county, 7 in the town of Hammond alone. Factory Road in that town was so named because of the cream ‘factory’ situated there. 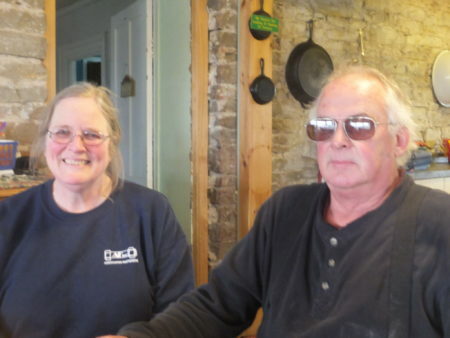 Although that factory has long been gone, failing as dairy preferences changed and demand mounted for fluid milk in the early part of the 20th century, a farm on Factory Road, two miles from Canada, is where Brian and Liz Bawden have raised their family and still milk 55 cows. Liz is president of NODPA (Northeast Organic Dairy Producers Association) and a member of the NOFA-NY board. Liz was trained as a naturalist. She worked in parks and museums, mostly – for the Audubon Society in Massachusetts, the Connecticut Children’s Museum in West Hartford, the Dallas Nature Center, and ended up with the Toronto Conservation Authority at Blackcreek Village, organizing their interpretive staff. That is where she met and soon married Brian, becoming a dairy farmer by marrying one. Bawden feels that farming, for women, is a way of working to contribute to the support of the home, and raising your family at the same time. She says: “You are gardening, canning, doing the housework, working in the barn – doing all those things while you still have your kids. You don’t have to farm them out to anyone else. A lot of women don’t have that choice. I think it is really important to kids to have both parents with them when they are growing up. On a farm you can have that. “Nathan,” Liz recalls, “when he was three years old was feeding out the salt and minerals to the cows from his little pail and teaspoon. He knew every cow, remembered their faces. That teaches kids, at a very young age, that they have a contribution to make. And they want to help. ‘When the tricycles leave the barn, that’s the end of the farm’ is really true of dairies. You always want another generation coming along. But it took awhile for Liz to get used to the isolation of farming. Brian’s grandfather came to Canada as a child, as one of the many who were brought over from Britain during the air raids in World War II. He ended up as a classic mixed farmer there – shipping cream and raising crops, beef, poultry and a little of everything. Canada has a supply management system, so dairy farmers have a quota, based on kilos of butterfat they have the right to ship. Brian wanted to go in a different direction, though, and sold his quota. Then Liz became pregnant and the couple decided if they could possibly farm without her having to go back to work, they would. But things were difficult on the farm without a quota, so they decided to move to the US. Brian had read about organic farming (or ‘ecological farming’)in the 1970s. One day he mentioned it to the milk inspector, saying: “You know I’m kind of interested in organic. If there is an organic milk market we should check that out.” The next day the man from Horizon Organic was in the driveway with a contract! They shipped their first organic milk in September of 2000. Over the years their son Nathan grew into a young man and they built the herd up to 115, counting the calves, heifers and dry cows. The original farm did not have enough land for a herd that size, so they also bought two nearby farms, ending up owning 425 acres plus a second house. several Amish communities to the area. Their black buggies and horse-drawn equipment are evident on local roads and fields. “Dairy is the main Amish cash income.” says Brian, “but the milk processors aren’t taking on any new dairy farms so it is a tough time for them. “They milk by hand,” he continues, “and take the milk in milk cans to their community milk houses, where there will be five to six electric coolers. The facility has to be in the coop’s name to have electricity. The farmers will sell the coop a half acre of land and the coop then builds the milk house, puts the electricity in, and bills the farmers back. The Bawden’s organic certifier is the NOFA-NY LLC. Liz got active in NOFA by getting on a peer review committee for their certification program. Liz has been active in the Northeast Organic Dairy Producers’ Association (NODPA) since 2002. She appreciates the fact that organic dairy farmers are so willing to share information with each other. Milk is a nutrient-dense fluid and supports rapid microbial reproduction, which can spoil the milk. Extreme temperature is usually used to prevent that. Cold below 40˚ F slows microbial growth and heat above 145˚ F for 30 minutes (or 161˚ F for 15 seconds) kills almost all microbes. Federal and state laws require that virtually all milk and dairy products sold in the US must be pasteurized. Thus it is chilled immediately after milking, picked up daily at the farm by a processor, taken to a processing facility, and heated to the required level for pasteurization. Cold milk can go a day from being picked up until it is processed. The tankers aren’t refrigerated, but they are insulated so the milk will stay cold for a while. In the Northeast we have a lot of consumers and not enough farms to supply them. So for the most part we are constantly trucking milk in from other regions that are oversupplied. When the Bawdens converted to organic, Horizon was the only organic brand picking up in the area. Now at least four processors — Horizon, Organic Valley, Maple Hill and Upstate Farms – serve the region with trucks. That competition is a good thing for farmers. But there is a national oversupply of organic milk and the producer’s relationship with the processor is not as firm as it once was. “Now you don’t actually get a contract,” says Brian, “just a letter of commitment — at least from Horizon. It’s all in their favor. They can terminate at any time, but we can’t. The way the price works is they commit to a base price. It used to be about $25 a hundredweight but that has been declining. Then there would be additional premiums, which could be worth up to an extra $10. There are premiums for components like butterfat, premiums for quality and what they call ‘market adjusted’ premiums. If you have a Holstein herd like the Bawdens the average butterfat of your milk is about 4%. With Guernseys or Jerseys it will be higher. At a butterfat count above 3.5%, which is considered whole milk, the farmer gets a premium. The primary factor that dairy farmers can control, when it comes to farm viability, is the diet of the cows. In non-organic operations the conventional wisdom holds that if you keep your cows in the barn and don’t put them out, they will use up less energy on exercise and you will thus get higher milk production. But a lot of organic farmers feel that pastured cows are healthier – because of the exercise they get, and also the nutrients they browse. When the Organic Foods Production Act (OFPA), the law setting up the National Organic Program, was passed in 1990 it specified that cows should get these benefits by being out on pasture during the grazing season. It didn’t occur to anyone at the time that they had to spell out what ‘grazing season’ actually means. But some certifiers took the position that, because there wasn’t any quantifiable specification in the act, the duration of a farm’s grazing season was left up to the producer. There were dairies that simply did not graze their cows at all. Or they would graze their dry cows but left the milking cows inside. This omission enabled farms to follow traditional conventional dairy practices of confinement, yet qualify as organic. After a few years organic producers became concerned that too much milk produced under inadequate standards was reaching the market. 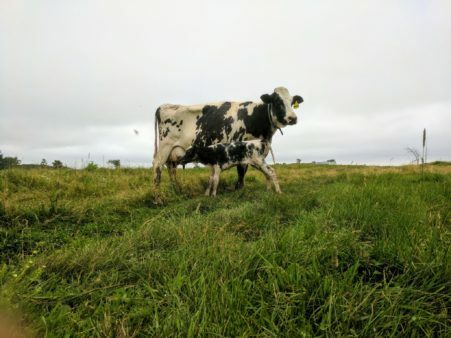 NOFA-NY dairy farmers, including Liz, Kathy Arnold and Kevin and Lisa Engelbert, helped form a coalition with other organic groups around the country to create a Pasture Rule with some teeth in it. 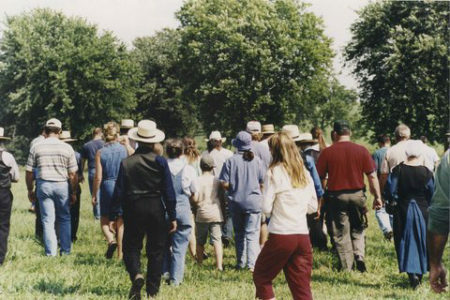 They joined with the ODPAs (Organic Dairy Producers’ Associations) in the Western, Midwest, and Northeastern states that were also organizing around the grazing issue, forming an umbrellas group called FOOD Farmers (the Federation of Organic Dairy Farmers). Their biggest concern was to come up with a Pasture Rule for organic production that enforced adequate grazing but didn’t put some organic farmer out of business because it was too stringent. What they came up with is that cows should be able to graze in the grazing season, which shall be not less than 120 days, and that during that period they should get no less than 30% of their nutrition, on a dry matter basis, from the grazing. For those not familiar with feeding cows, measuring ‘dry matter’ is a way to standardize various ruminant feeds by ignoring the moisture in them. Virtually all feeds contain some water, but fresh grass has a lot more than dried hay. If you know how much water is in your feeds, then you can compare them on a ‘dry matter’ basis. Fresh grass varies but is usually between 17% and 30% dry matter. Baleage (hay baled before it is fully dry and then wrapped in plastic and allowed to ferment before being fed) can be anywhere from 25 to 45%. Hay has some moisture, but is close to 90% dry matter. Grain is considered 89%. Liz says that she feels the coalition that came up with these draft regulations was a farmer-based organization. The drafts were then sent to Ed Maltby, NOPDA executive director, who was active with NOC (the National Organic Caucus). Then groups like MOSES, Food and Water Watch, and other consumer groups would have input on all the things in the drafts they felt it was important to change and modify. The process took a long time before approval was final. The Pasture Rule ultimately became law in 2010. “Were there people opposed to it?” Liz asks. “For sure. I was told there were a lot of large CAFOs from California watching closely. They wanted to go organic, but if the Pasture Rule passed they might not. I’ve never been to a dairy CAFO, but I’ve seen pictures of Aurora, with 15,000 cows in one location in Colorado. I know I’m not seeing what looks like any reasonable amount of pasture. I know how many acres per cow we need here, and we get rain! “Yet they are certified by the Colorado Department of Agriculture and Oregon Tilth,” she continues. “But Colorado didn’t have a certification program when Aurora started up. So Aurora said ‘We’ll tell you how to do this.’ Brian and I pay about $2000 to be certified each year. But when you have a CAFO or business that is the size of Aurora, the certification fees are going to pay the entire salary of the person doing the inspection. They’re big enough they can change the rules. Competition from big organic CAFOs has hurt dairy farmers in New York. Aurora is in Colorado and Texas, but milk packaged by Aurora was sold in New York under the ‘Woodstock Farms’ label, Liz says. The organic task force, a group Liz was part of that was organized in New York with a lot of organic dairy members, was telling people that if you want local organic milk you should buy containers that have ‘36’ as the first part of the processing plant code. That plant is in New York. Of course the milk could come from Pennsylvania or Connecticut, because milk is trucked across state lines, but it would have been processed in New York. Liz believes certifiers are also responsible for the problem: “People in the East said QAI (Quality Assurance International), Oregon Tilth, and CCOF are the ones that certified questionable CAFOs. We have always been certified by NOFA-NY. They have a reputation as a tough certifier. That is not necessarily a bad thing. It keeps you on your toes. But there are always people looking for a certifier who will let you do what you want. It just boils down to human greed.